In the Sengoku period, a rounin called Nanashi (meaning nameless) saves a young boy Kotarou and his dog Tobimaru at an abandoned temple. 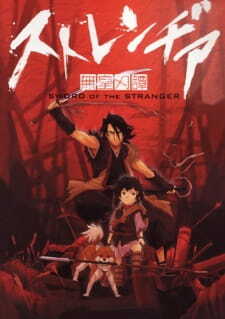 Kotarou has no family, is pursued by a mysterious militia organization from China, and hires Nanashi as his bodyguard. Among the pursuers is a man called Rarou, a very skilled warrior with blond hair and blue eyes. He obeys an old man called Byakuran and is a member of the Chinese militia. Unlike his companions in the militia, he is not serving any Emperor and just wants to fight with the strong. Direction wise, the art style, soundtrack, animation, action choreography and setting is amazing. This is one of the best anime movies that can set an atmosphere so powerfully and hold that for the entire movie. It never becomes boring, dry or slow. The action is breathtaking and just awesome. Story wise, the charecters are amazing. Each of them have their own motives, passions and past that drive them, and the mesh of these create a complex yet moving story. The arc of the main charecter isn't abrupt, and well developed. The story is not purely cliche'd, it retains a lot of seriousness throughout the movie. Honestly, I reccomend this movie to all those who love anime movies or appreciate amazing direction and storytelling. The Sword of The Strangers movie is listed?